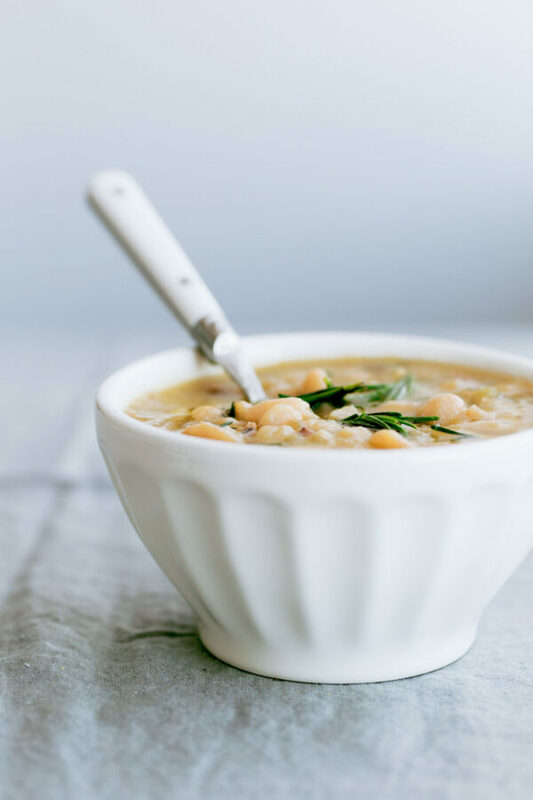 This hearty Slow Cooker Cannellini Bean Soup with Fresh Rosemary is packed with flavor, healthy protein and fiber, and only contains a handful of ingredients! Today’s recipe is in partnership with Bob’s Red Mill. Almost three years ago, I was sitting in a beautiful cobblestone square in Naples, Italy eating one of the most comforting soups that I’d ever had. It was a classic Italian cannellini bean soup. 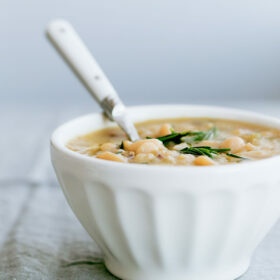 The soup itself was deceivingly simple, flavored with bits of crispy pancetta and a glug of spicy olive oil, and packed with creamy, tender cannellini beans. 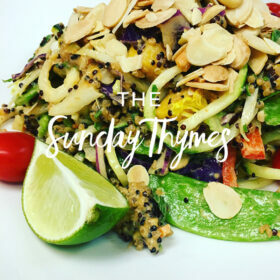 It was one of those meals that you don’t forget quickly – the setting notwithstanding – but a wonderful reminder to keep things simple in the kitchen whenever possible. Great quality ingredients don’t need and shouldn’t be covered up with fancy garnishes or extraneous flavors. Three years later, it was also the inspiration behind today’s slow cooker cannellini bean soup, which I’m very excited to share with you today. 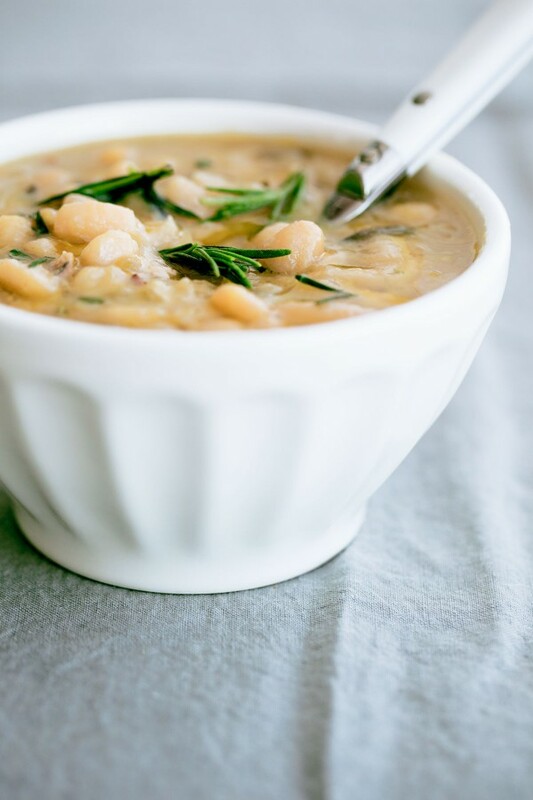 The slow cooker cannellini bean soup only has a handful of ingredients – I love it! 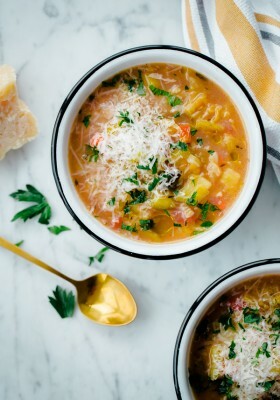 While it would be delicious in vegetarian form, this soup does contain a bit of bacon (a slightly easier substitute to Italian pancetta, but feel free to use that too!) to give the soup a touch of smokiness. 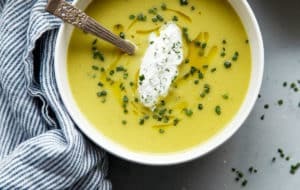 The fresh rosemary contributes a ton of flavor to this soup as well, so don’t be tempted to skip it. Diced leek and celery are quickly sautéed in the rendered bacon fat (the bacon is going in there too – just two strips!) and combined with dried bay leaves, a hefty sprig of fresh rosemary, an entire pound of Bob’s Red Mill heritage cannellini beans, and chicken broth. Yes, that’s it! I’ve been using Bob’s Red Mill products for years and years – and am so proud to be working with them this year on lots of fun, new recipes for you guys! One of my kitchen goals this year is to cook with more dried beans and lentils. After all, 2016 is the year of legumes, right? Dried beans take a bit more time and preparation, but are one of the most affordable, flavorful, and delicious sources of protein, fiber, and nutrients that you can get your hands on! It is my opinion that they don’t get the credit and love that they deserve in the kitchen – and I’m hoping that I can showcase them in more recipes this year. Thankfully, a slow cooker is one the best kitchen appliances that you can have for cooking dried beans easily. While most dried beans, especially bigger dried beans, require soaking for 6 to 8 hours before cooking, most dried beans, including these cannellini beans, can go from dried to perfectly cooked in about 8 to 10 hours of slow cooker time. One of the most nutritious parts of dried beans is the liquid that they cook in (avoid throwing it out whenever possible!). 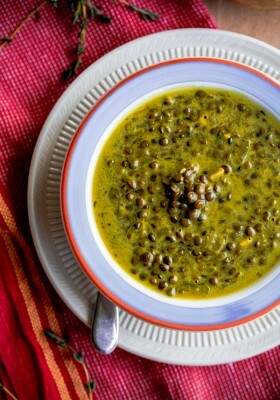 Most of the nutrients from dried beans are transferred to the cooking liquid itself – and in this soup you get it all! This means that you can do the prep for this recipe (just 15 to 20 minutes worth!) 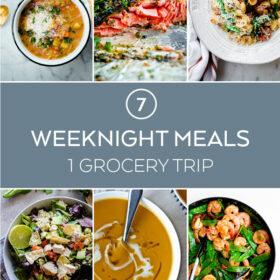 in the morning, throw everything in the slow cooker, and come home from work with dinner waiting for you on your kitchen countertop. Once the soup is ready, I like to puree a large ladleful of it in a food processor and then add this back into the rest of the soup soup. 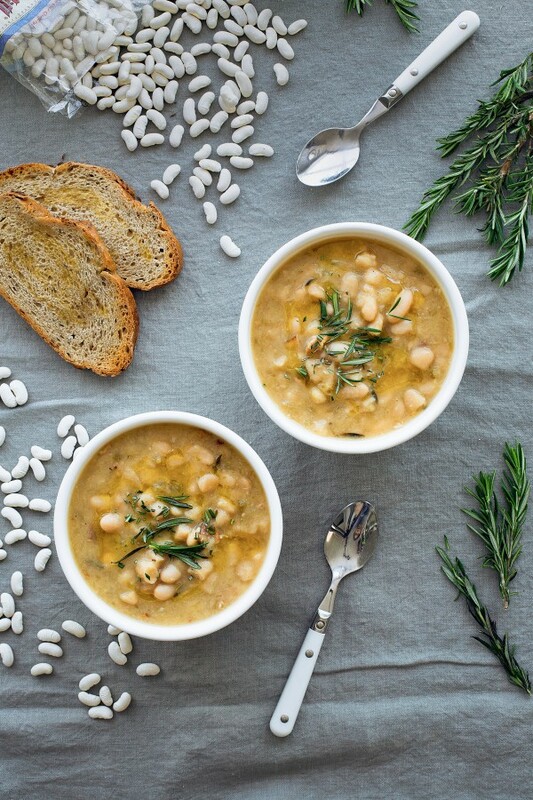 It adds a bit of creaminess to the broth – but you keep all the lovely texture of the cooked cannellini beans! If you own a stovetop-safe slow cooker insert (alternatively, you can do this in a normal saucepan or skillet and transfer it to the slow cooker): Heat the insert over medium heat. Add the diced bacon and cook, stirring frequently, until the bacon is crispy and most of the fat has rendered. Using a slotted spoon, transfer the bacon, leaving the rendered fat behind, to a small bowl. Add the sliced leeks to the pot and reduce the heat to medium-low. Sauté the leeks, stirring occasionally, until they are just beginning to soften, about 3 to 4 minutes. Add the diced celery, dried bay leaves, and fresh rosemary sprig, and sauté for an additional 5 to 6 minutes, stirring occasionally. Transfer the insert to the slow cooker base. Add the cooked bacon, the rinsed cannellini beans, and chicken broth. Stir together. 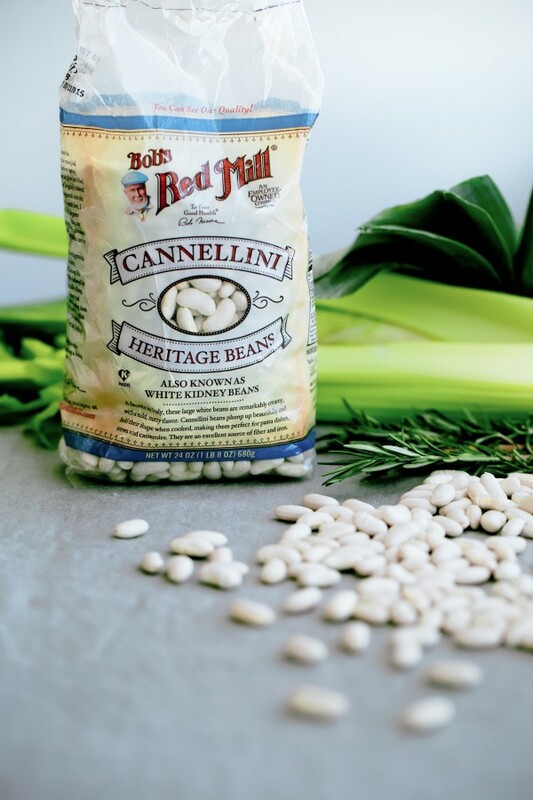 Cook on low heat for 8 hours, or until the cannellini beans are cooked, tender, and very fragrant. Remove the dried bay leaves and any tough rosemary stalks, if present. Transfer one large ladleful of soup (roughly 1 cup) to a small food processor blender and puree until mostly smooth. Transfer the pureed soup back into the slow cooker with the remaining soup and stir. Serve hot with a glug of extra virgin olive oil and a sprinkling of fresh chopped rosemary. If you’re having difficulty slicing the bacon, try placing it in the freezer for 10 to 15 minutes! Frozen or very cold bacon will make for easier slicing and dicing. Only 6 ounces of Chicken broth for a pound of beans? That doesn’t seem enough. Yikes!! Thank you for catching that mis-type Linda – that was supposed to be 6 CUPS (not ounces!). 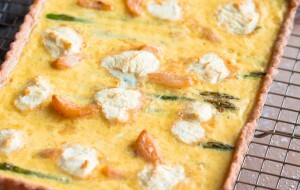 So sorry for the confusion – the recipe has been updated! Thanks Melanie! Haha! I totally agree. I LOVE rosemary and wish I could have it fresh on hand at all times! This soup looks amazing Laura! I love the addition of the bacon and rosemary. So much flavor in such a simple recipe! Looks delicious and super healthy! On my never-ending list! Is there a version of this to not use the slow cooker? I really want to make this recipe but don’t own a slow cooker. Hi Jessica! Totally understand the dilemma, because I didn’t own a slow cooker until last year. Ok, so I haven’t made this particular soup on the stove before – BUT I’m pretty sure you could do it this way. It will require soaking the dried beans overnight. So, I would cover and soak the dried cannellini beans in water for 6-8 hours. Follow the rest of the recipe using a large soup pot (cook the bacon, add the leeks, etc.) and then just add the pre-soaked, drained cannellini beans to the pot along with the stock. You’ll have to bring it to a boil, lower to a simmer, and then cook it for probably 45 minutes to 1 hour (or until the beans are tender). Please let me know if that works, because I’d love to know and be able to add a note to the recipe for others! That makes sense and I will definitely try it and let you know how it goes! When do I add the salt and pepper? Just to taste at the end? Hi Courtney! I feel nervous specifying salt quantities, because salt density varies GREATLY by brand (I actually just wrote a post about this. But! I would recommend adding some as it is cooking (1/4 teaspoon kosher salt – I use Diamond Crystal brand) and adding more to taste once it is done. The bacon and broth contributes salt, so it doesn’t need as much as you might think! Hi Laura! Can you cook on medium or high heat for a shorter amount of time? Like 5-6 hours? This was really good! I made it as written except I couldn’t find dried cannellini beans so I used great northern beans instead. Very yummy for a cold Chicago winter! Awesome! Thanks for the recipe feedback! I normally use the instant pot when Cook dry beans . I use the Bean/ chilli setting . It comes out very well . I just soaked the white beans tonight. Planning to cook tomorrow in the instant pot..